Competition classes are available in Show Jumping, Working Hunter, Ridden and In Hand. 1. 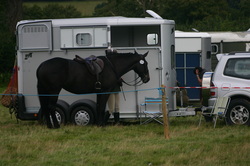 Only horses and ponies competing will be allowed onto the Show ground. 2. All entrants must hold Public Liability Insurance. 3. Correct headgear and suitable footwear must be worn at all times when mounted. A hard hat must be worn by everyone leading a horse on the show field. 4. No horses (without allocated entry number) to enter any of the practice or competition rings. 5. Practice jumps and collecting rings will be closed and dismantled after the start of the last jumping class. 8. The organizers reserve the right to refuse entry without any reason being given and if necessary to alter or cancel any classes at anytime. 9. All horses/ponies must be 4 years old or over to compete in ridden classes. 10. Any objections must be received in writing within 15 minutes of the conclusion of the class together with a £20 deposit, which will be refunded if the objection is upheld. 11. The organizers and landowners do not accept any responsibility or liability for any accident, damage, injury or illness to any person, animal or property whatsoever arising out of, or at this event. 12. All vehicles parked at owners’ risk. ​13. Do not muck out lorries/trailers on the showground.